TOKYO, May 24. /TASS/. Implementation of an eight-point cooperation plan agreed between Russia and Japan has been positively influencing the economy, Director of the European department of Japan’s Foreign Ministry Yasushi Masaki who has actively participated in preparatory activities prior to Japanese PM Shinzo Abe’s visit to Russia on May 24-27, said in an interview with TASS. According to the diplomat, bilateral trade between the two neighbors soared by almost 25%, and it keeps growing. "This month marks sharply two years since the moment when PM Abe presented an eight-point cooperation plan to President Putin. 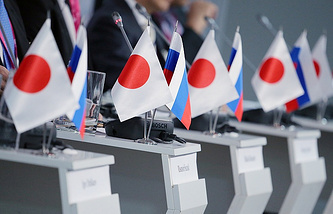 It aims at developing the whole range of bilateral ties, promoting the kind of cooperation that will enable many Russian citizens to feel better living conditions with the use of Japanese technologies and expertise," the diplomat said. "Last year Russian-Japanese trade soared by 24.8%, and it is growing now as well. Hopefully, trade and investments will continue growth as the cooperation plan is specified," he said, adding that an impressive number of cooperation agreements signed since Russian President Vladimir Putin’s visit to Japan in 2016 is "having a positive impact on real economy." Over the past several years the economic cooperation between the two countries has been based on the cooperation plan offered by Shinzo Abe at a meeting with Russian President Vladimir Putin in Sochi on May 6, 2016. The plan includes efforts to foster relations between Japan and Russia in the energy sector, small and medium-sized businesses, the promotion of industrialization of the Far East, expansion of the export base, as well as the proposal to strengthen cooperation in the cutting-edge technologies, including nuclear energy, and the sphere of humanitarian exchanges. The two sides also consider joint economic activities to be a step towards making a peace treaty.